I’ve started a little garden in my apartment which I fondly name Mini Eden (Yes, there’s Adam and Eve in form on Lego people). It started with some air-filtering plants which I purchased from the nursery. 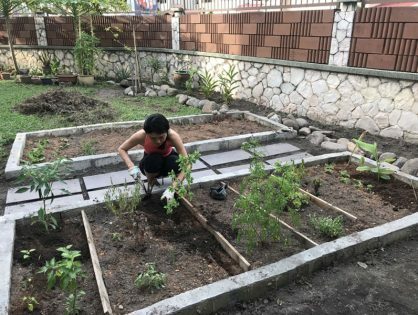 Recently, I decided to change my garden into an edible one with plants like Brazilian spinach, and local herbs like Indian borage, sawtooth coriander and sambung nyawa (Read: Indian Borage Herbal Tea). To make space for them, I had to transfer other plants like my Chinese Evergreen into other parts of the house. The only suitable space seems to be the bathroom. It was amazing how a little change make such a big difference to the ambience. Shower time is much more relaxing; I feel as though I’m bathing in a jungle. So I decided to add more green plants into my bathroom. Being a city girl, naturally I’m a consumer by default. When I need something, my first thought is “Where can I buy it?” instead of “How do I make it? (Though I’m trying to change my mindset). When I wanted air-filtering plants, I bought a few from the nursery. This time, I thought I’ll get the money plant which coils around the huge tree I always see when I swim in the apartment pool. So I went to the garden with a pair of scissors and snipped some plants off. Instead of planting it in soil, I thought of growing it in water. 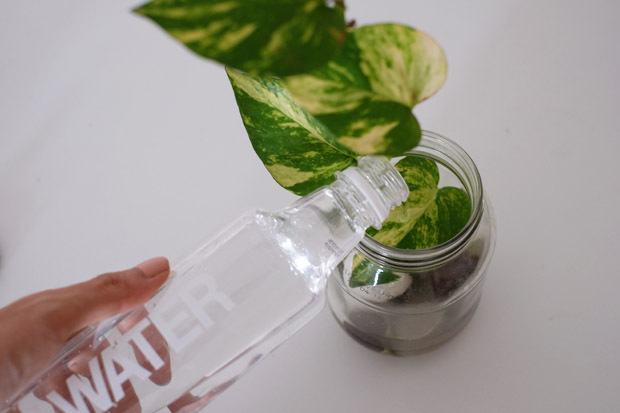 Money plant can survive using minerals in the water. 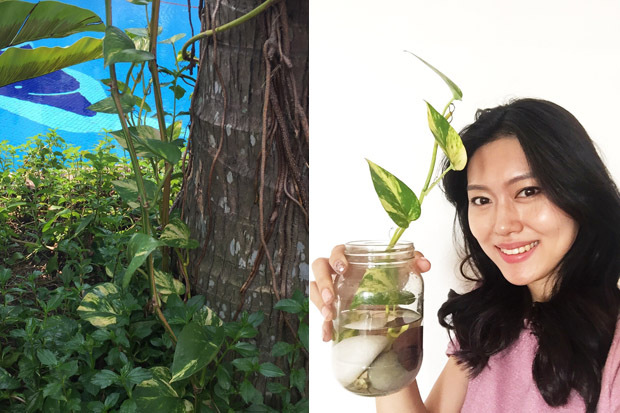 Although it grow faster in soil, I think growing in water is just fine for my needs. It’s easy to do and much prettier to boot. Snip of a few stems from a tree. 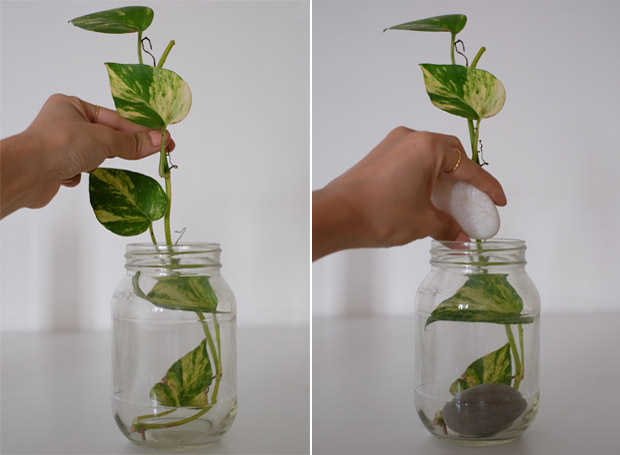 Place money plant into glass jar. 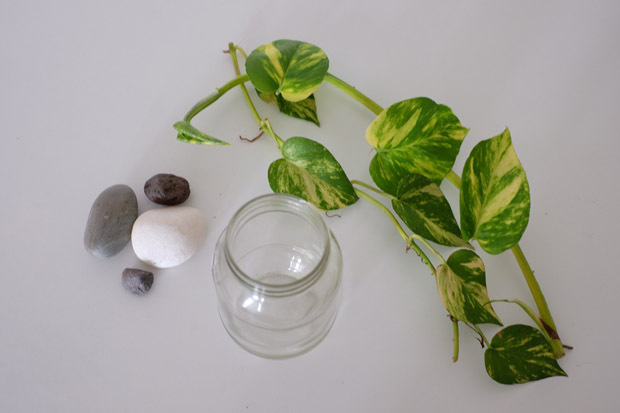 To secure the plant, place some stones in the container. Soon, the shoots will grow roots around them. Pour water into the jar. Change the water every week to prevent mosquitoes from breeding. There are a few types of Money Plants. 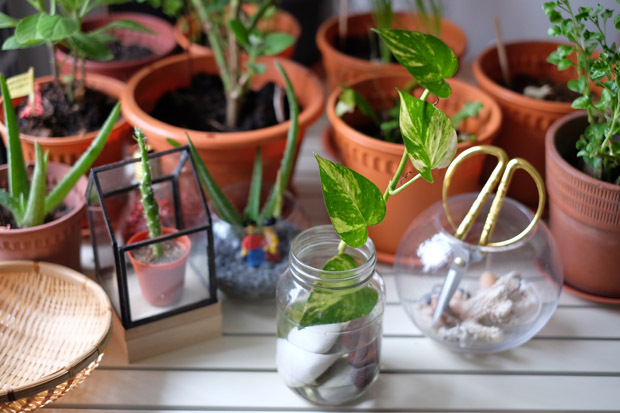 The one that I have is epipremnum aureum. It’a also known as Devil’s Ivy. I like the different pattern and colour on the leaves. However, it is harder to care for. So if you want something that is maintenance, choose the plain leaves variety. Note that all parts of the plants are poisonous (it contains calcium oxalate crystals). It’s harmful when ingested and may irritated the skin. 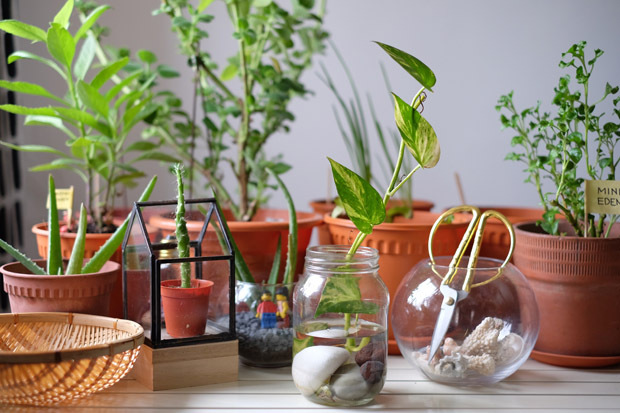 Do wash your hands with soapy water after dealing with it (source: Stephanie Choo’s Guide to Gardening In Small Spaces). Stephanie suggested that we might want to use gloves when handling the plant. I didn’t and my hands were fine. To maintain the shape, you need to cut it occasionally. This is such a simple project, using materials that are already available. 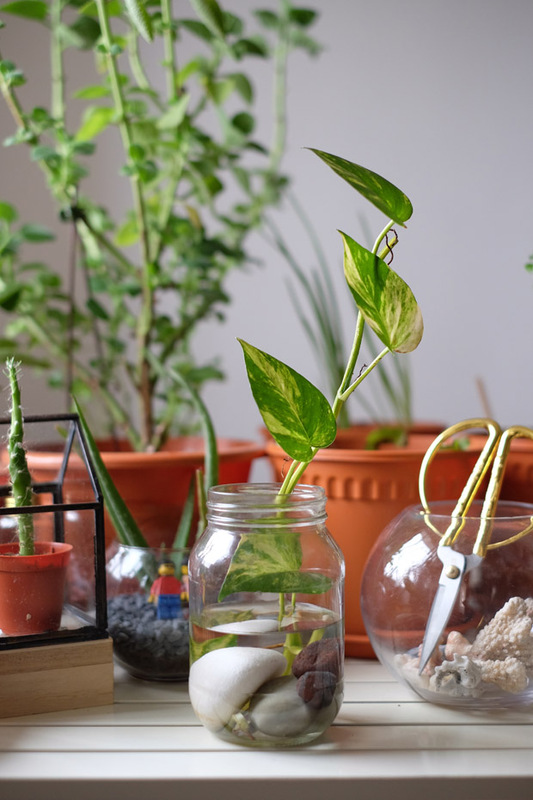 I really didn’t have to spend money on the first money plant I bought (which died when I went for a holiday for two weeks), when its so readily available. 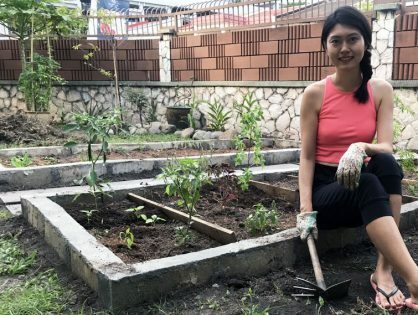 Check out your neighbour’s garden, by the roadside or at the apartment garden ground. 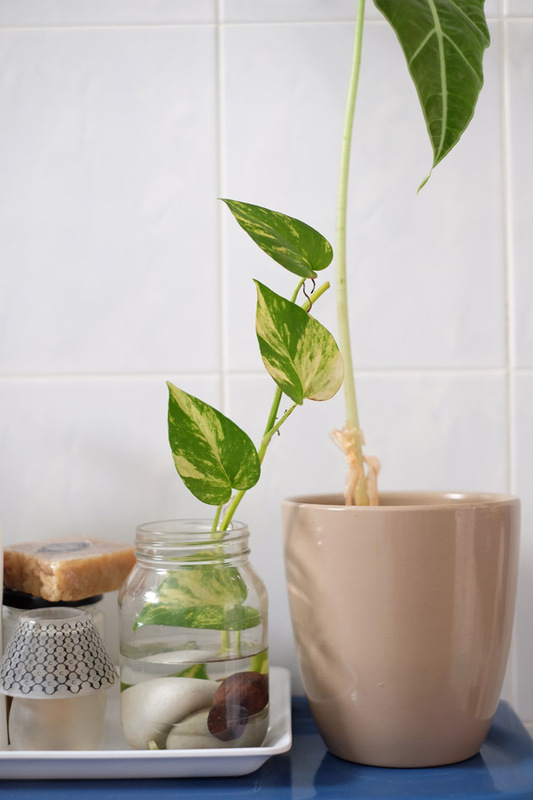 I encourage you to bring money plant to decorate your home. Not only it is pretty, it’s helps filter the air and is believed to bring prosperity into the house. Have fun greening your bathroom!